JJ Yeley and the No. 83 Burger King / Dr Pepper Toyota Camry team finished 30th at Michigan International Speedway on Sunday afternoon. Ryan Truex was scheduled to compete in the event, but a hard hit in the turn two wall during final practice sent Truex to a local hospital where he was diagnosed with a concussion. The Sunoco Rookie contender was evaluated and released, but was not cleared to race. Instead, the BK Racing team turned to NASCAR veteran JJ Yeley to drive the No. 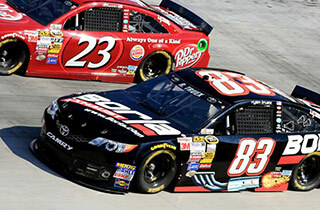 83 Burger King / Dr Pepper Toyota Camry in Sunday's race. As a result of substituting the driver and pulling out a back up car, Yeley was forced to start the 400-mile race from the rear of the field. He used the opening laps to feel out the racecar and work with his BK Racing team to determine what changes would need to be made during the opening round of pit stops. With his car loose entering the turns and tight through the center, the Burger King / Dr Pepper team devised a plan of chassis and air pressure adjustments for their Toyota Camry during the opening round of pit stops. When a nine-car accident broke out in Turn 1 on lap 25, Yeley was collected as another competitor spun him from behind. Luckily, the damage was very minor and the team was able to repair the damage in a series of pit stops. By the time the checkered flag waved, Yeley was scored with a 30th-place finish. "I'm very thankful for Ron Devine giving me the opportunity to jump in the No. 83 Burger King / Dr Pepper Toyota Camry this weekend," commented Yeley. "Of course, I hate getting in the car because someone else is hurt, and I hope Ryan is back to feeling 100% very soon. Without any practice time, we weren't really sure what to expect today. However, the BK Racing team did a great job getting the backup car ready to go, and given the circumstances, I'm happy with our performance." Truex will follow-up with his doctors in the Charlotte, N.C. area, where he will focus on getting approval to return to the driver's seat of the No. 83 Burger King / Dr Pepper Toyota Camry. Prior to returning to competition, Truex will need to gain approval to race per the NASCAR rulebook.